Thank you for contacting me with your concerns regarding the proposed Quail Brush Generation Project. I welcome the opportunity to respond to you on this important issue. I am aware of San Diego Gas & Electric’s (SDG&E) application to the California Energy Commission (CEC) to build a gas-fired power plant, and have heard many concerns from the residents of Santee regarding this matter. As you indicated, representatives from the CEC held a workshop this past week to hear from concerned residents. My schedule as a Member of Congress required that I be in Washington, D.C., so I was not able to attend the meetings in San Diego this week. Further, my role as a federal legislator limits my involvement in this issue as it is currently being considered on the state and local level. However, I do understand that the Santee City Council voted unanimously on a resolution Wednesday, voicing opposition to the plant. Also, San Diego planning commissioners have delayed a decision to potentially change the zoning of the site while the CEC still considers the permit request. I believe it is imperative that any effort to develop energy resources must be performed with the safety of the public and environment in mind. In the past, I have opposed projects that would adversely affect private property owners and are not in the best interest of our community. Regardless, I will continue to monitor the developments of this issue as it affects Santee, and should the matter extend to the federal level, I will keep your concerns firmly in mind. Thank you once again for contacting me. If you have any further questions or concerns, please do not hesitate to let me know. Posters against the power plant from local community college students. Click here to see the gallery. The “conceptual” design and mitigation factors result in a noise map that essentially comes in just under the limits permitted. The mitigated noise map clearly indicates that this is based on “conceptualized” mitigation measures. The unmitigated map indicates there will be 65-75 dBA (decibels) of noise and disturbance within the light mint area on the map. Imagine a constant buzz and drone. A dog barking or an alarm clock is 70 dBA. 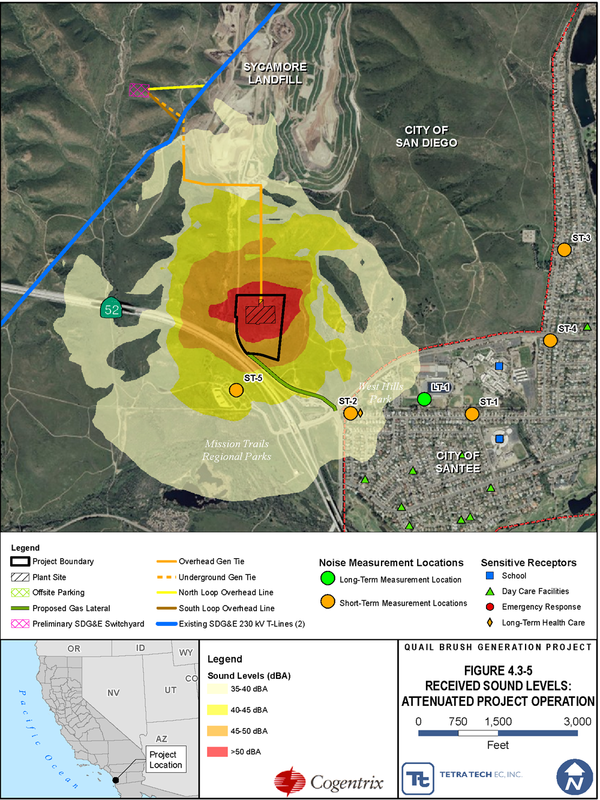 The mitigated map indicates there will be 35-40 dBA (decibels) of noise and disturbance if you are anywhere within the light yellow area on the map. This noise measurements are based on what the power plant will produce. It does not include freeway or ambient noise from other sources. You need to add these other noises for an accumulative effect. Below is a rendering of the proposed power plant. 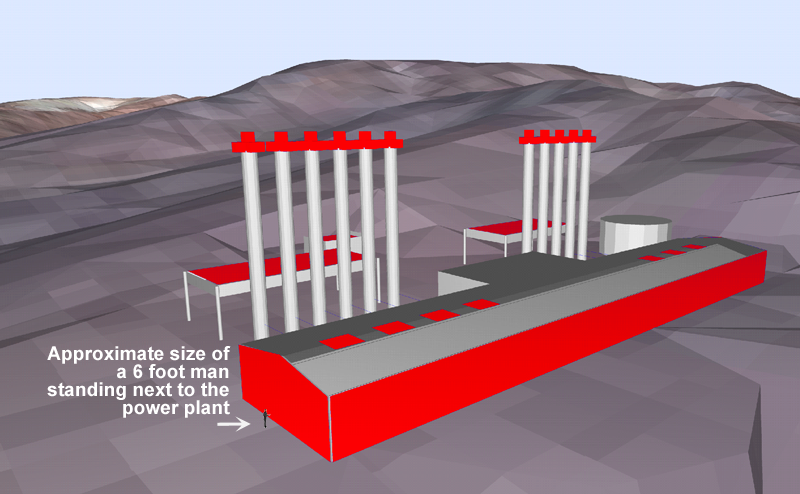 The image includes a six foot person to provide size and scale comprehension (the power plant’s color is not red). Email or fax your opposition to the SD Planning Commission TODAY! SD staff is recommending approval to initiate a Plan Amendment to allow the “Quail Brush”/Santee Power Plant atrocity. Email the Planning Commission and all local officials listed further below (copy/paste into your email as one list). The Quail Brush project conflicts with the following documents: the East Elliott Community Plan, which designates the site as Open Space; the General Plan, which designates the site as Park, Open Space, and Recreation; and the Municipal Code, which designates the site’s zoning as single-family residential (RS-1-8). Cogentrix wants to amend the Community and General Plan by initiating a rezoning from residential to industrial in open space area that was designated to be protected. What is the specific justifiable criteria for initiating this change? Why is the city of San Diego even considering making changes to these plans and it’s own codes at the expense of the surrounding communities and federally endangered species that live there? 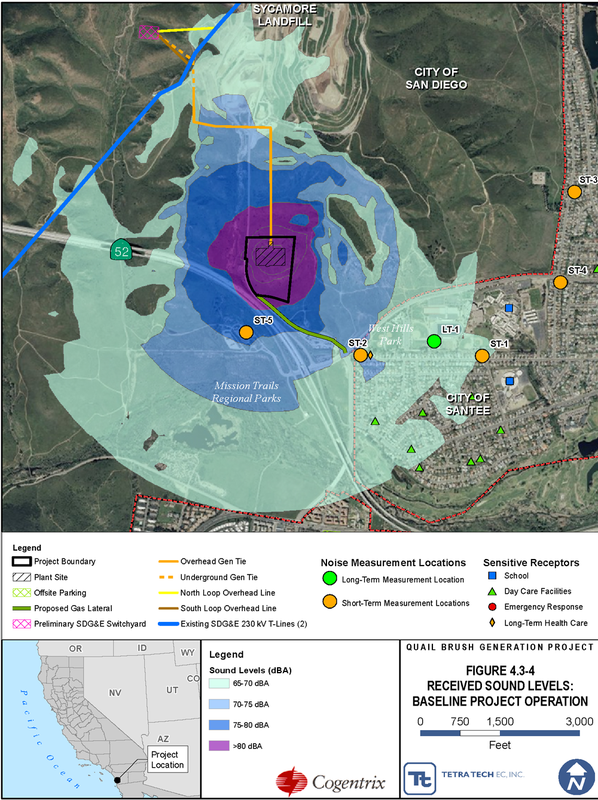 Is the building of the 11, 100 ft stacks, using technology that is dated and inefficient, far more important than our quality of life, health of our seniors and children, and the peace and tranquility that the Mission Trails Regional Park has provided since around 1962? Since the park was a 2000 acre gift from the Federal Government to be used for open space supporting the residential community, shouldn’t the city of San Diego at least entertain the thought of supporting the federal government’s mandate to move away from fossil-fuel based energy and instead look to solar energy? Solar panels on rooftops will harness surplus galore since San Diego gets abundant sunshine year round. We OPPOSE this initiation and demand its withdrawal. We, the people are watching our cities’ actions closely now and will find it suspect should the city of San Diego’s Planning Commission vote to allow this permanently damaging change so that a power company can place their plant in a location that is most convenient and cost effective for them so they can increase their gross profits at the communities’ expense in every conceivable way. Author Jeffrey KahnPosted on March 13, 2012 July 19, 2012 Categories Community46 Comments on Email or fax your opposition to the SD Planning Commission TODAY!